When it comes to foundation repair, there are a variety of solutions that work. What you choose for your foundation repair solution will depend on what is causing the foundation damage, how extensive the foundation problem is, and what type of foundation structure is being supported. For a free, no-obligation estimate on the best foundation repair solution for you and your home. Call or contact us online today! All of our Foundation Repair contractors at FoundationRepairExperts.com are prescreened, licensed & insured providing foundation solutions. Foundation push piers are the appropriate solution for your home if your foundation walls are experiencing vertical movement (such as sinking), your chimney is tilting or not flush with the house, or the soils around the foundation are subsiding, expansive, active, or hydro-compactable. However, foundation piers come in two different designs: push piers and helical piers. Helical piers have a corkscrew design at the end of their shafts. They're best applied for lighter loads and smaller structures, such as patios, steps, sun rooms, and porches. They perform their job in most soil conditions, with a life of 100 years or more. Helical piers install easily on older or weaker structures and can be used for pre-construction or new construction bearing systems in poor soils. Helical Piers require exterior excavation during installation, which means the removal of lancscaping, paving, and other obstacles before installation. They may allow the opportunity to lift the structure to a flatter, more level position, therby closing or shrinking existing cracks in the structure and potentially straightening leaning chimneys. However, helical piers cannot guarantee perfectly flat or level conditions, improve the water tightness, or lower the moisture level of a basement. Foundation push piers provide an extremely strong foundation support that can handle large jobs and heavy loads. Designed to drive deep into the earth with minimal skin friction, they reach deep into stronger load-bearing strata below the foundation. Push piers offer the deepest penetration of any type, and are able to be used in low-impact interior installations. They can perform their job in most soil conditions, lasting for more than a hundred years. Push piers allow for the likelihood of rising their structures to flatter, more level conditions and the possibility of closing or shrinking existing cracks in the brick, stucco, drywall, or other interior and exterior finishes. Sticking doors, jammed windows, and leaning chimneys may also be repaired. However, push piers cannot ensure perfectly flat or level conditions, lateral restraint to a bowing foundation wall, or improved water tightness or water moisture in a basement. No matter what kind of foundation pier is best for your structure, we have the foundation repair contractor that can help you. Each of our contractors offers a free on-site evaluation and written quote to solve your foundation problem. For a free foundation repair estimate, call or e-mail us today! Foundation anchors will permanently stabilize your foundation walls while offering the opportunity to straighten your walls over time. 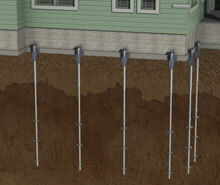 Cost efficient and heavy-duty, these anchors can install with no need to disrupt or replace the foundation. The anchors embed securely in strong soils, only needing a small area to be dug in the yard (and carefully replaced) in order to properly install the anchor. Installations can often be completed in a single day and can be done so year-round. Helical anchors (also referred to as tiebacks) are commonly used to support cracked, bowed, or leaning foundation or retaining walls. They provide an ideal alternative to wall anchor systems used in large retaining walls, commercial projects, or in cases where a traditional wall anchor cannot be installed. Helical Anchor Systems are screwed mechanically into your soil with a hydraulic torque motor. The tieback is then secured against your foundation wall with an interior plate. They're appropriate for walls affected by hydrostatic pressure, expansive clay soul, or other instances in which the walls have begun to bow due to pressures. Regardless of your foundation problems, we can connect you with the expert foundation contractor with the experience, training, and products you need. Each of our pre-screened contractors can provide you with a solution that will repair your foundation, restore the value of your home, and give you peace of mind for many years to come. Call or contact us online today for a free foundation repair quote! Damp, musty crawl spaces can mean a serious problem. As part of the lower structure of the house, they serve as one component of the load-bearing system in your home. As mold, rot, and water damage set in, wood support beams can begin to rot and decay. Additionally, poor supporting soils can fail to offer your foundation support beams the strength they need to hold up the weight of the house, causing them to sink downwards. Whether it's the rotting, failing beams or sinking supports due to soils that swell and shrink with moisture, a small crawl space structural problem quickly becomes a big one. As crawl space supports fail, floors can sag, doors can jam, and mold can collect and send spores into the main area of the home. A house with foundation problems in the crawl space will be difficult if not impossible to sell at a good price, and as the problem worsens, putting off the repairs will eventually cease to be an option. The best way to repair crawl space supports with crawl space jacks. These supplemental structural supports consist of steel beams that are installed underneath the crawl space. During installation, a hole is dug at each location of the support and filled with a densely-packed engineered fill. On top of this, a solid concrete base is laid, and a heavy adjustable steel column is mounted between the concrete base and the floor joist above. Crawl space jacks are far superior to other methods. Not only are they a portable, easy-to-use option in tight places, but they install in about a day and can even potentially adjust the crawl space ceiling to its proper position. Crawl space jacks are extremely strong, with the best supporting vertical loads of well over 50,000 pounds apiece, and they provide a much stronger and more reliable support than concrete support beams. For a free quote and consultation on your crawl space structural problem, call or contact us today!